Few other mobile home communities for adults 55 and over in Central Florida offer a more splendid setting and better onsite amenities than Cypress Lakes. 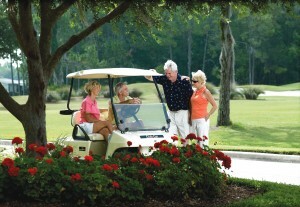 Our 1,000-acre gated community caters to energetic seniors who desire to live full- or part-time among beautiful wooded surroundings and in the company of friendly, fun-loving neighbors. Cypress Lakes is a retirement community that offers residents the perfect combination of resort-style living, affordably priced manufactured housing, and a culture that promotes having fun, staying active, and being healthy. Who says retirement has to be boring? At Cypress Lakes, our residents have a wide variety of amenities, functions, and structured activities at their daily disposal. Much of life at our community centers around our two 18-hole onsite golf courses and our 30,000-square-foot clubhouse … two perks that you’ll be hard pressed to find at most other Central FL mobile home communities. Big Cypress Grill – Our spacious clubhouse is home to a full-service restaurant and tavern offering daily specials and a varied menu. Fitness center – We have constructed a state-of-the-art facility featuring modern exercise equipment, group programs, and professional one-on-one fitness instruction. Special interest clubs – There are more than 60 organized clubs at Cypress Lakes, with new ones forming all the time. A great way for our residents to have fun is to spend quality time with others who share similar interests, such as golf, tennis, shuffleboard, painting, jewelry making, cards, yoga, and dancing. Contact Cypress Lakes today if you think that you might be interested in becoming a resident of our wonderful 55+ community. When evaluating mobile home communities in Central FL, remember that Cypress Lakes is specifically geared toward promoting an active retirement lifestyle, and is designed to make that type of lifestyle affordable. A Lifestyle Consultant on our team will be happy to speak with you about Cypress Lakes and how it measures up to other mobile home communities in the region.